Simon has a book coming out this week called We First. Simon was kind enough to send me a few bullets about the book down below so those of you interested in the book (that should be all of you) know what it’s about. I’ve also embedded a recent video Simon did for the book. Hopefully this will reinforce why you’ll want to read the book. 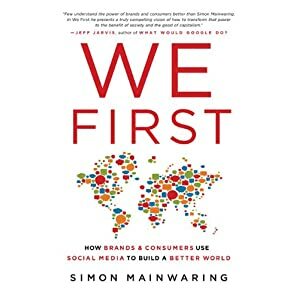 The core premise of We First is that all corporations, businesses, consumers and citizens need to work together as partners and begin using capitalism as a driver of prosperity by standing in opposition to the traditional ‘me first’ mentality of free market capitalism. Social media gives consumers new platforms to influence the purpose of capitalism and the behavior of companies while, at the same time, offers brands an opportunity to engage in meaningful dialogue with consumers about shared interests and values, enabling both brands and consumers to translate their shared values to create a more sustainable economic system. We First proposes that capitalism must look beyond our immediate needs and acknowledge that sometimes our self-interest is best served through compromise or solutions that promise gains over the long term, or rather, that good self-interest benefits society because it fulfills the needs of individuals while respecting those of others, whereas selfishness detracts from society because it fulfills only one individual’s needs. We First discusses “profit as purpose” to refer to a model in which businesses, while making a profit, also have a positive impact on the world, for a business that commits to profit with purpose also seeks to infuse greater meaning into the lives of all the stakeholders it touches, as well as all other parties effected by the business’s presence. We First sustainability refers to the fact that capitalist enterprises must preserve the planet’s resources for future generations and, for capitalism to survive, businesses need to figure out how to create a prosperous society of consumers who have the financial resources and living standards to support the very existence of capitalism because, if capitalism doesn’t provide jobs and decent wages to people, there is no market. By the way, I get NOTHING for writing this post and have not received a free book. I am doing this because Simon is one of the nicest/smartest/well-spoken guys out there. Too often we do disclosures because there is a possibility that we’ve been tainted or influenced in some way. In this case, I can only say I’m influenced by the fact that Simon just does things right.